When I entered medical school, the statistics told me there were more women students than ever before joining the field. Yet, I still find myself confronted with experiences that remind me it is still male-dominated. As an exercise in self-discovery, I have started reading more about women’s history. Starting with reading about the battle over the Equal Rights Amendment, I thought looking back through accounts of this movement might help me better understand my experiences. At first, I wasn’t sure of the role that my femininity played in my experiences in medicine. I realized that what I wasn’t seeing, just below the surface, was that I was standing on the shoulders of thousands of women who came before me to make my career possible. Women whose legacies are not yet complete and of which I have inextricably become a part. In 2018 is it really possible to feel as if you don’t belong in a career solely because of your gender? Isn’t that the stuff of history? I imagine the women who advocated for the Equal Rights Amendments in the 1970s would likely be shocked and probably offended by my ignorance. The fight for women’s liberation is hardly history, the ERA movement spanned from 1971-1982, just about ten years before I was born. Section 3. This article shall take effect 2 years after the date of ratification. 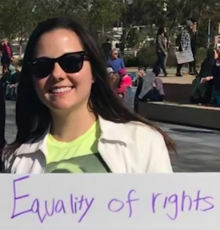 Cecilia Leggett at the Women’s March. Between 1971-1977, thirty-five states ratified the amendment, falling just three states short of adoption. A cohort of conservative women, with Phyllis Schlafly as the most prominent figurehead, led the fight against ERA. Groups like “Women Who Want to be Women” and “Stop ERA” put together campaigns based on the premise that men and women did not have equal roles in society. They coordinated lobbying campaigns where they sent homemade pies to members of Congress with their letters about ERA opposition. She made many arguments to this effect without ever addressing how women who dream a different dream could possibly thrive in the world she describes. To be clear, I do not admonish homemakers. My father was a homemaker and stayed home to care for my brother and me. I have the utmost respect for people who elect to take care of their families full time. I think it is crucial that the role of “homemaker” remain a choice and not a predetermined and exclusively female obligation. How could someone like me reach my goals if Schlafly’s worldview had persisted. What if her framework had become mainstream? I can only imagine what it must have been like to be an ERA advocate in the 70s with your dreams and opportunities seemingly on the line. 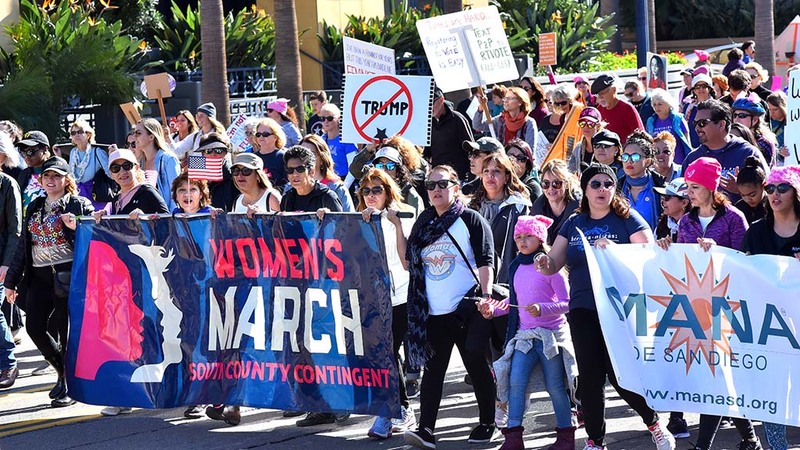 And that brings me to the 2018 San Diego Women’s March. This woman told me how much it meant to her to see someone still advocating for this amendment that she had fought for during one of the peaks of the women’s liberation movement. I asked her if she would like to take a picture with my sign, and I was honored to snap the photo of her smiling broadly with my ERA sign standing next to her husband, smiling just as wide. Florida was a battleground state for ERA ratification. I wish I could have heard her stories from 1973 but I lost her in the crowd at the march. The National Organization for Women‘s Florida chapter was established in 1973, in part to organize the pro-ERA efforts. Florida never ratified the ERA. The time period for ratification and ERA voting ending in 1982. Many of the protections pro-ERA advocates were fighting for are provided by the 14th amendment. Yet, to this day, it takes fierce advocates like Ruth Bader Ginsburg and the American Civil Liberties Union to make sure women are actually protected to the full extent of the law. My encounter with this woman at the march was a wake up call. I wasn’t reading about women’s history, but participating in it. This is a living history. Marching alongside a woman who fought for the ERA, I realized the fight can’t possibly feel like history to her. We are not generations away from a time where people felt comfortable to say that men and women were not equal, that we have pre-determined roles to fulfill in society, that big ideas, hopes and dreams are for men while women are to be homemakers to pave the way for their sons to dream and to choose their own destiny while their daughters walk a pre-determined path. This is in our lifetime and could easily be our reality if it weren’t for the women who came before us paving the way for choice and opportunity. Yesterday I met history in real time and realized, this isn’t history at all. Not yet, at least. Cecilia B. Leggett is a third year medical student at UC San Diego School of Medicine. She is active in healthcare policy advocacy and leads the Politics in Medicine Student Interest Group. She is interested in internal medicine, obesity and bariatric medicine, and women’s health.